Did you know “Black Friday” references an accounting term: “in the black,” meaning the massive sales and Christmas shopping on this day each year is intended to help make businesses financially stable, to reflect black, positive income numbers on their balance sheets rather than negative red ones? 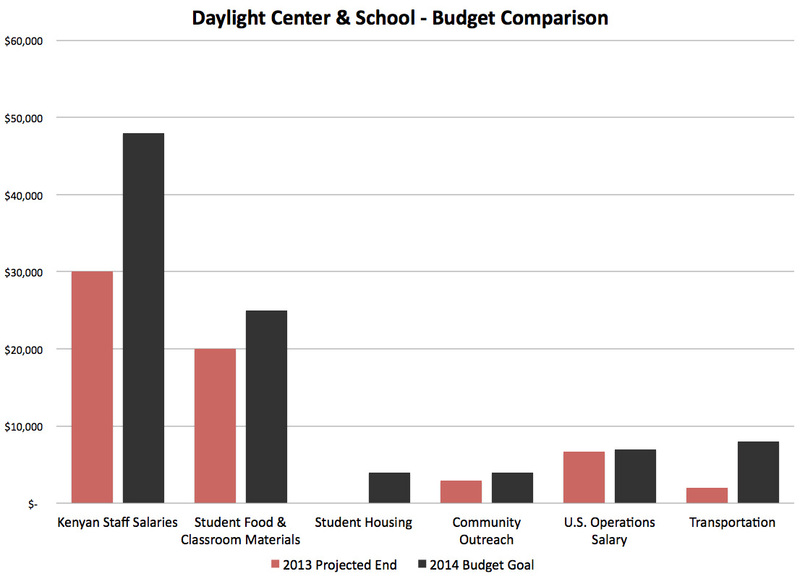 For the last 2 years, Daylight has been operating at about 65% of our ideal budget. This means, mostly, that our teachers have graciously accepted a much lower wage than what they could earn at other schools. This year marks our very first official pledge drive, in an effort to be “in the black” in 2014 and closer to our ideal budget of $96,000 for the year. We believe that if we had 75 pledgers of various giving levels, we can reach this goal. So far, 22 people have pledged to support Daylight in 2014! Will you join us? Call or email me to make a pledge or learn more about making a pledge to support Daylight in 2014. You may also visit our support page to learn how to setup a monthly, recurring donation to Daylight. As you do your Christmas shopping, consider giving a gift to Daylight in honor of your friends and family. Simply print our Honor Gift Card, or contact us to send the gift card(s) on your behalf. I just wanted to share with you one of the highlights from my recent trip to Daylight earlier this month. It was wonderful. Larry Vukov and Rod Brown from Autumn Ridge in Rochester, MN, and Pastor Cader Howard and Steve Spark from First Presbyterian in Stillwater joined me. We were able to take the school three new computers. 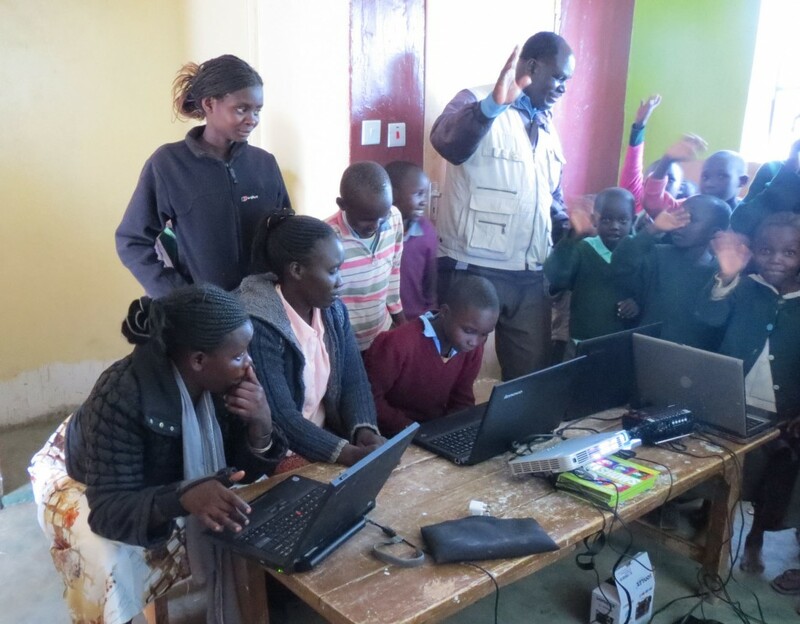 Cader set up a computer lab for the kids and they were unbelievably excited and cute. The first day, they typed their names and-using the Daylight projector-see it on the wall. They all cheered each time someone was successful. By the end of the week, the kids in the upper classes were able to type paragraphs and make corrections to punctuation and capitalization. At one point, Cader left the room. He then heard music. The kids had been able-on their own-to access the music files on the computer and make it play. Kizito-the new headmaster-explained that Kenya has a program to provide a laptop to every first grader in the government schools. Kizito said that “Daylight is ahead of the country.” His goal is to have Daylight be the best school in the region and he thinks we are well on the way to achieving that. This Saturday, come listen to the music of Allison Raney and hear about the “Year in Stories, Bricks, Books, and Budgets” at the Daylight Supporter Appreciation Tea. We can’t wait to see you! Speaking of music…we had a great benefit show last Friday at Solomon’s Porch Church. Big thanks to bands We Are the Willows, Eustace the Dragon, Phillips Phonograph, and Eric Seivert. We raised $1200! The Thanksgiving season is near and we wish to recognize those for whom we are thankful. That means you!